Chrome 4-Speed Ring Mounts Over the Rubber 4-Speed Boot. 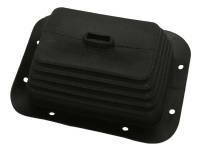 Fits 1970-74 E-Body, 1970-74 B-Body. 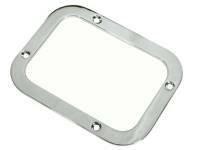 New reproduction console shifter trim ring for 1971-74 B-body and 1970-74 E-body vehicles. Replace your old trim ring with our reproduction made to fit like original. Made to fit like original with original markings and screw holes. 1971-74 B- & E-Body T-Handle Shifter. Faithfully Reproduced to Be Better Than the Original, Yet Exacting in Every Detail. No Longer Available from Chrysler Corp.